A member of the band Skinny Lyzzards looks on before taking the stage. Daniel Maglio performed a comedy bit in which a cop smelled wine, not water, in an open container his brother had when their car was pulled over. The punchline? “Praise the lord, he’s done it again!” Maglio cried out. With “inside” and “outside” students, in the parlance of the program, sitting side-by-side, that line got a laugh from the whole crowd. Former journalist Kathie Klarreich founded Exchange for Change, a writing program that pairs inmates in Florida prisons with students at local universities and high schools. According to the Florida Department of Corrections, 61% of inmates in state prisons lack adult basic education, meaning they’ve scored below high school level in reading or math assessments. Juan Esquival holds up his poem ‘Butterflies in Prison,’ a meditation on seeing a butterfly flutter inside the prison fence. In three years, Exchange for Change’s program at Dade Correctional Institution has grown from a single workshop to 15 classes with more than 100 students. Last year, the group offered its first class on graphic novels. Just before Christmas, an audience of college students, neighbors and fellow inmates filed into a cinder-block visitation room at Dade Correctional Institution, outside Homestead, and took their seats beneath murals of Mount Rushmore and Mickey Mouse. For two hours, they alternated between tears and laughter, spellbound by a performance that ran the gamut from spoken-word poetry to songwriting and standup comedy. Unquestionably, they were moved. 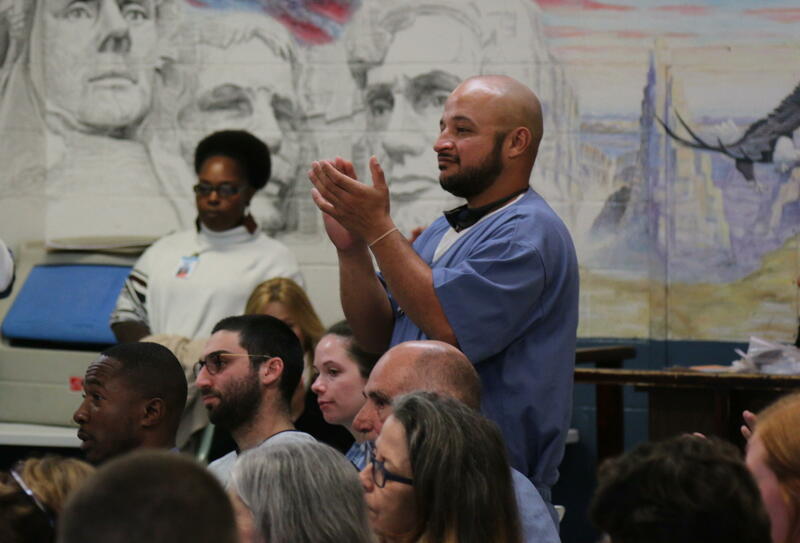 The talent showcase featured more than two dozen incarcerated men celebrating their graduation from Exchange for Change, an educational arts program that pairs students behind bars with classes at high schools and universities around South Florida. In three years, Exchange for Change’s program at Dade Correctional Institution has grown from a workshop of 17 to 15 classes with a total of 117 students, who hone their craft in everything from memoir and graphic novels to essays and poetry grappling with the moral weight of their past crimes. Elvin Guzman rises to applaud a friend’s heartfelt remembrance of his wife, who died of breast cancer while he was behind bars. Breaking with common practice in Florida’s 143 prisons—where so-called lifers are typically barred from participating in “betterment” classes—half the performers were serving life sentences. As the deadliest prison in Florida, Dade Correctional Institution has been in the news primarily for horrific accounts of abuse of mentally-ill inmates like Darren Rainey, who was scalded to death in a shower there in 2012. Running the program is not without challenges. Last year, dozens of visitors to the graduation ceremony were caught up in an hours-long lockdown because an inmate had escaped from a work crew; in November, an Exchange for Change student nearly died when he was stabbed in the neck over a stolen cell phone. Stories like these are one reason Dade hosts no other community-run enrichment programs alongside core offerings like literacy and GED classes run by Department of Corrections staff. Update: The scheduled performance by Bill T. Jones at the Arsht Center has been canceled because of weather. A few years ago, Bill T. Jones thought there was a good chance his nephew Lance was going to die. He was so sick. Bill T. Jones is hugely influential — as a choreographer and dancer, a writer and thinker — and when he thought his nephew was dying, he wanted to make sure his story stayed in the world.